The International Book Club gives its members a chance to experience the world from the comfort of their favorite chair and then meet up to discuss their journeys at their local book shop. Each month we explore a different author from a different country. We'll uncover lesser-known classics, check out a current best-seller, or just finally read that book you've always meant to get around to. Stop by Peace Coffee on your way in and join us at Moon Palace Books on Saturday, April 3rd at 2pm for a discussion of Near to the Wild Heart by Clarice Lispector. All are welcome but please RSVP at our store, by phone (612-454-0455) or by email (info@moonpalacebooks.com) and we'll set up a chair for you! Clarice Lispector, Near to the Wild Heart. Clarice Lispector was born Chaya Pinkhasovna Lispector to a Jewish family in western Ukraine. When she was an infant, her family moved to Brazil. While she studied law at the University of Brazil, she began working as a journalist and publishing short stories. Her first novel, Near to the Wild Heart, won the Graça Aranha Prize for the best debut novel of 1943. She married Maury Gurgel Valente, a diplomat in 1943; they had two sons but later divorced, and Clarice returned to Brazil in 1959. She died of ovarian cancer at age 57. Clarice Lispector is currently considered a "single author." If one or more works are by a distinct, homonymous authors, go ahead and split the author. 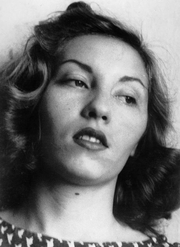 Clarice Lispector is composed of 14 names. You can examine and separate out names.